Each year thousands of hatchling turtles emerge from their nests on Sanibel and Captiva. Once they hatch and emerge from the sand, they embark on a perilous journey with challenges every step of the way. From the moment they hatch and into adulthood, the obstacles they face are staggering. Sadly, only an estimated one in 1,000 to 10,000 will survive to become reproductively active adults. The biggest threats to sea turtles are caused by humans, but the good news is that there are many things within our control that can be changed. Click here to see how you can help. Boat strikes are widely acknowledged as a significant threat to all species of sea turtles. Sea turtles can be hit when they come to the surface to breathe or when feeding or mating in shallow areas. Sea turtles don’t see or hear very well when their heads are out of the water, and they usually don’t react quickly enough to approaching boats in time to move to safety. Slowing the vessel below planing speed reduces the likelihood of catastrophic damage, even without any diving on the part of the turtle. Blunt-force trauma from boat impact or propellers can injure or kill sea turtles. According to the Sea Turtle Stranding Network, trauma is the most significant source of mortality for sea turtles in Florida. One of the major threats to adult and immature sea turtles in the ocean is accidental capture during fishing operations, including shrimp trawls, longlines, dredges, pound nets, pot fisheries, and hand lines. Every year, an estimated 150,000 turtles of all species are killed in shrimp trawls. More than 200,000 loggerheads and 50,000 leatherbacks are captured, injured or killed by longlines¹. Although the number of turtles that drown in gill nets is difficult to estimate but is believed to be comparable to trawl and longline mortality. To reduce the negative impacts of trawl fishing gear on sea turtles, the federal government worked with the commercial shrimp trawl industry to develop Turtle Excluder Devices, or TEDs. A TED is a device that allows a captured sea turtle to escape when they get caught in a fisherman’s net. They have a grid of bars with an opening either at the top or bottom of the trawl net. 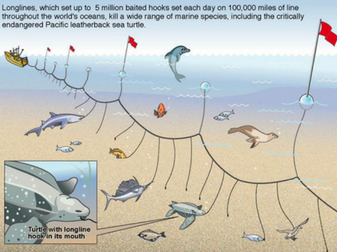 The grid is fitted into the neck of the trawl net, so small animals such as shrimp can pass through the bars, but large animals (such as sea turtles) get stopped by the grid bars which prevents the turtle from passing into the back of the net. A small opening in the net is then available either above or below the grid so that the turtle is able to escape the net unharmed. TEDS are very effective when implemented correctly. Unfortunately, not all fisherman comply with the law, and sea turtles continue to drown in shrimp nets. Marine debris is any man-made, solid material that enters the marine environment either intentionally or unintentionally. Examples of marine debris that is commonly seen on Sanibel and Captiva are straws, plastic bags, soda cans, discarded fishing line, and cigarette butts. This garbage ends up in the ocean and can seriously harm marine life, including sea turtles. 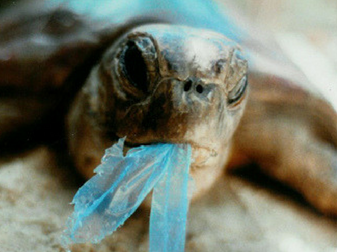 Mistaking trash for food, sea turtles are known to eat plastics and other buoyant debris. If sea turtles ingest plastic particles, they can become sick or even starve to death because they feel full after swallowing the debris. Debris in the form of abandoned fishing lines and netting is very problematic because sea turtles are prone to getting entangled in discarded fishing gear. In recent years an alarming number of patients suffering from monofilament entanglement have been admitted to the Center for Rehabilitation of Wildlife (CROW), prompting the initiation of a Clear Your Gear campaign on Sanibel. The collaborative group includes members from the City of Sanibel, CROW, Ding Darling National Wildlife Refuge, Sea School, Ding Darling Wildlife Society, and SCCF that are working together to reduce the impacts of monofilament on wildlife. Clear here to learn more about this initiative. H atching and nesting sea turtles need dark beaches to find the sea. They instinctively crawl towards the brightest point on the horizon, which is the reflection of the moon and stars of the sea on a natural beach. Increased beachfront development has resulted in increased light pollution, which can cause sea turtle hatchlings to become disoriented when they emerge from their nests. Instead of crawling to the sea, they wander inland where they often die of dehydration, predation, or being run over by cars on streets. 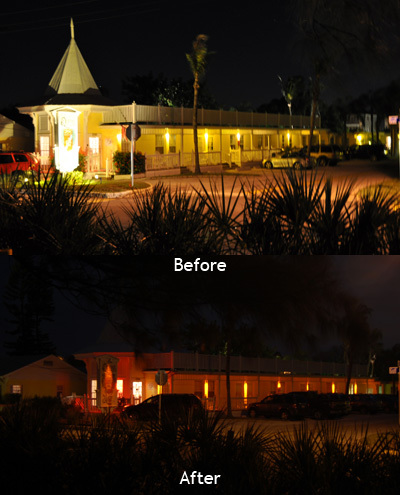 Additionally, artificial lights can discourage females from nesting, causing them to choose a less optimal nesting site. The most serious threat is disturbance to nesting females. Human presence on the beach at night can cause females to stop nesting and return to the ocean without laying eggs. Furniture left on the beach overnight can cause obstacles for turtles on the beach and discourage them from laying eggs. It is also possible for nesting females to become entrapped in beach furniture. Holes on the beach pose a significant challenge for nesting and hatchling sea turtles, as they can become injured or trapped when they fall into holes that are not filled at the end of the day. It is important to remember that we’re sharing the beach with sea turtles and other wildlife. There are simple steps beachgoers can take to keep our beaches safe for sea turtles. Please see here to learn more! Barrier islands are naturally very dynamic, with sand shifting continuously along the beach. 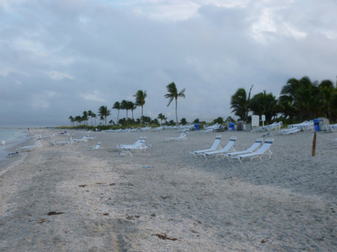 Beaches in Florida are densely developed, prompting us to keep the beaches static to protect homes and infrastructure from erosion. Many property owners have built coastal armoring structures such as sea walls, rock revetments, and sandbags to help protect their property from this natural erosion. Hard structures on the beach reduce the amount of sandy nesting habitat that sea turtles need to lay their eggs. Sea turtles attempting to nest where beach armoring occurs are often displaced to less optimal nesting areas. Predation of sea turtles by crabs, birds, fish, sharks, and mammals is a natural part of the food chain. However, predators may sometimes become so proficient at finding and destroying nests that they threaten all the nests on a beach. 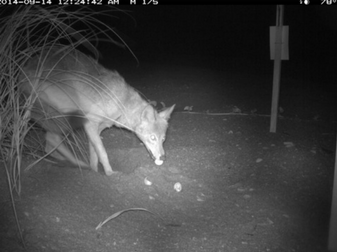 Eggs and hatchlings on the beaches of Sanibel and Captiva are victim to coyotes, ghost crabs, fire ants, and birds. SCCF staff and volunteers help to control mammalian predation by placing a self-releasing screen over threatened nests. The screens are large enough to keep predators out, yet allow hatchlings to escape from the nest without assistance. Mammalian predation often increases where trash has accumulated on the beach. An easy way to avoid attracting predators is to remove all trash on the beach. Sea turtles are vulnerable to ocean pollution at all stages of life, from eggs to hatchlings to juveniles to adults. Oil spills, runoff of contaminants such as fertilizers, untreated waste, and petroleum products all contribute to marine pollution. These pollutants can have serious impacts on sea turtles immediately through direct contact, or can build up in tissues over time and lead to a compromised immune system. 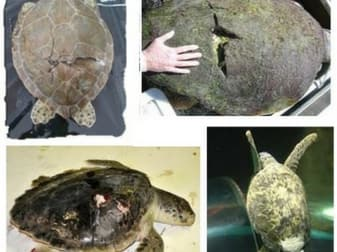 Research suggests that pollution in the oceans may be linked to fibropapillomas, a disease that is a threat to sea turtle populations worldwide. Also known as “FP”, this disease causes cauliflower-shaped tumors on sea turtles. Unfortunately, sea turtle habitat overlaps with areas that are at a high risk of being affected by offshore oil production. 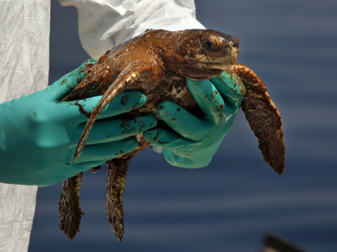 Petroleum pollution and oil from spills degrade habitat that is important for young turtles and it also washes up on beaches, degrading nesting habitat.